This cozy newsletter would be perfect for a neighborhood bookstore. The newsletter has adequate space for all sorts of information, including upcoming events, book-trading, staff picks, book highlights, book club details, and bestsellers. 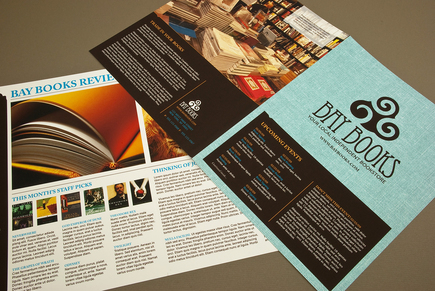 The fabric-like background texture gives the brochure a friendly intimate feel, which is appropriate for a local new-and-used bookstore.